Today’s post is part of the Monday’s Music Moves Me blog hop, hosted by X-Mas Dolly, and co-hosted by Callie of JAmerican Spice, Stacy of Stacy Uncorked and Cathy from Curious as a Cathy. Before we get started with today's music, let's go over the Battle of the Bands Results. The song was 'I Ain't Got Nobody', and our contenders were Fats Waller and Louis Armstrong. The votes went back and forth, and it was a very good battle, in my opinion. 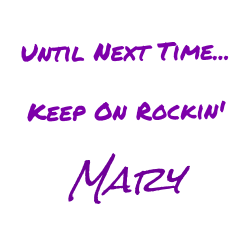 with new songs and new contenders. Everyone loves a good party when it’s your birthday, so let’s get this place a rockin’! 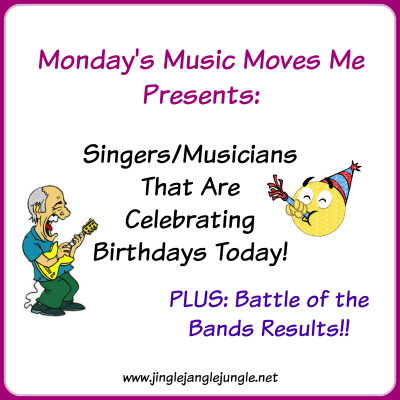 There are several musicians that have birthdays today, but I selected only 5 to highlight today. My apologies if I have omitted one of your favorites. As the saying goes ‘Age Before Beauty’... so we’ll start with the oldest. 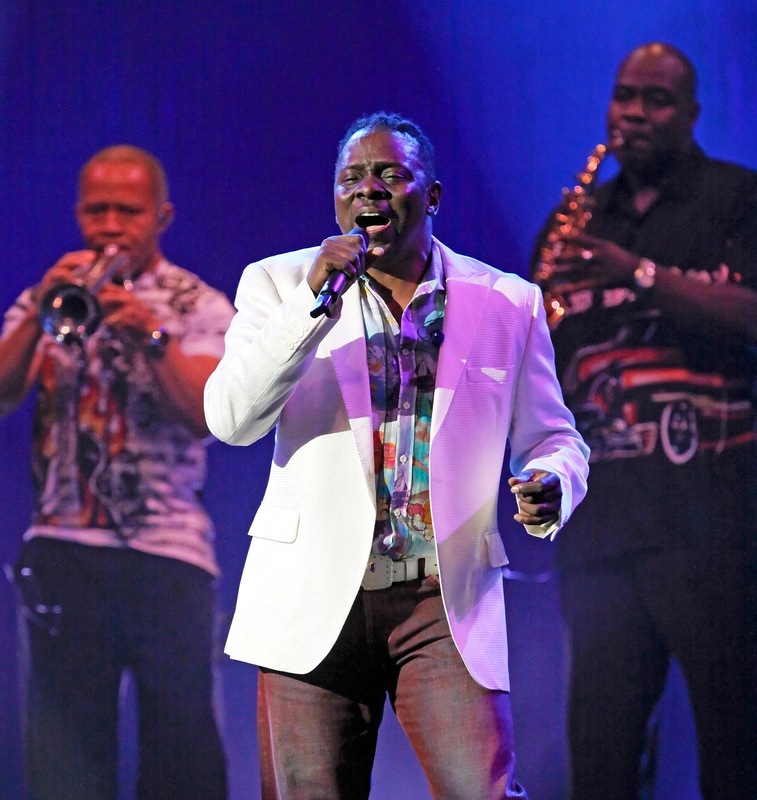 Philip is best known as an original member, and one of the two lead singers (along with group founder Maurice White) of the band Earth, Wind & Fire. Bailey has won seven Grammy Awards. He was inducted into the Rock and Roll Hall of Fame and the Vocal Group Hall of Fame as a member of Earth, Wind & Fire. Bailey was also inducted into the Songwriters Hall of Fame for his work with the band. Bailey has also released several solo albums. His album, Chinese Wall, included a duet with Phil Collins, “Easy Lover”. Bailey is currently married to singer/ songwriter, Valerie Bailey (formerly known as Valerie Davis), who has worked with superstars Whitney Houston, Celine Dion etc. Bailey is the father of seven children; One of his children, Pili Bailey, is the daughter of Jeanette Hutchinson of the R&B hit group the "Emotions". 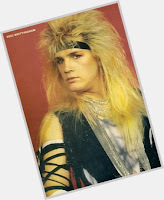 Eric Brittingham, turning 57 today. Eric is best known as the bassist and does backup vocals for the band, Cinderella. In addition to Cinderella, he was in a side-band with Cinderella bandmate Jeff LaBar simultaneously, called Naked Beggars, of which his wife, Inga Brittingham, is the lead vocalist. In 2009, Brittingham temporarily filled-in for Poison bassist Bobby Dall on Poison's Summer 2009 tour with Def Leppard when Dall became sick on tour. Currently, Eric plays bass in the Bret Michaels Band. 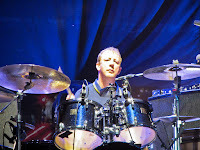 Dave is best known as the drummer for the band Blur. Dave is also a computer animator, and owns an animation company called Nanomation. He directed two series of the animated show Empire Square, which made its TV debut on 18 February 2005. He is also interested in computer graphics and has contributed to three research papers on topics related to non-photorealistic rendering. In 2006, when Blur when on hiatus, he studied to become a lawyer. He is currently employed in the criminal department of Kingsley Napley, a law firm in London. 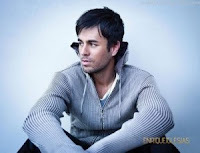 Iglesias started his career in the mid-1990s on an American Spanish-language record label Fonovisa Records under the name Enrique Martinez, before switching to the stage name Enrique Iglesias and becoming one of the biggest stars in Latin America and the Hispanic market in the United States. By the turn of the millennium, he had made a successful crossover into the mainstream market. Iglesias was born in Madrid, Spain, and is the third and youngest child of Spanish singer Julio Iglesias. His mother’s aunt is Nelle Adams, the first wife of American actor Steve McQueen and grandmother of actor Steven R. McQueen. When he was only 12 years old, Bonamassa opened for B.B. King. 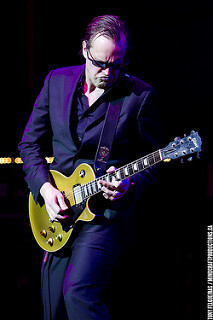 In the last 13 years Bonamassa has put out 15 solo albums through his independent record label J&R Adventures, of which 11 have reached #1 on the Billboard Blues charts. Bonamassa has played alongside such artists as Stephen Stills, Eric Clapton, Blondie Chaplin, Foreigner, Buddy Guy, Steve Winwood, Warren Haynes, and Derek Trucks among others. In addition to his music career, Joe Bonamassa runs a nonprofit organization called the Keeping the Blues Alive Foundation, whose mission it is to further music education by funding scholarships and providing music education resources to schools in need. Be sure to stop by the hostesses and the other participants in today's blog hop! Earth, Wind, & Fire excellent choice to open the dance floor with! Happy Birthday to Philip Bailey! I was pretty sure someone else would use Enrique as well today. "Hero" is a good song track! Joe Bonomassa is fabulous on the guitar! I think I remember his name. He's an excellent blues singer and makes me think of B.B. King. Great celebration here today and birthday wishes to all the boys! Thanks for joining the 4M crew this Monday, dearie! This was a fun theme for today. I worried there would be quite a bit of overlap, but there doesn't seem to be too much. Overall, it's gone smoothly. Happy Birthday to those musicians. I love learning celebrity facts, including birthdays. Like I share my birthday with Sir Cliff Richard and my nan shares hers with Elvis Presley. Those are some pretty cool dudes to be sharing birthdays with! Thanks for dropping in! You had a real horse race going there for awhile, but I see the great "Satchmo" took the lead in the clubhouse turn and then never looked back. Satch is very, very tough to beat in BOTB contests. If memory serves me (which it likely does not), I can think of only one time he lost a Battle, and that was on my blog where Hank "Bocephus" Williams Jr. beat him on the song AIN'T MISBEHAVIN', which in my view was the correct outcome because Hank just OWNS that song! Hard to believe but true. He just has too much fun with it and the way he modulates his voice throughout makes it a real joy to listen to. Looking forward to seeing what you have cooked up for the 15th. It was a good battle, indeed! And yes, our boy Satchmo took the lead early and ran, but it wasn't a total blowout. Now, if I had paired Fats Weller against the song that showed up in my recommended songs on youtube, Fats would have done very well. https://www.youtube.com/watch?v=g7Qajx8n0gA is what inspired this whole shebang for today. Yep, I think Fats Waller would have won that contest. I like Leon Redbone the way I like Reggae: I'm good for two or maybe three songs, but then it all starts sounding alike to me. Louis has the bigger name recognition so that could have swayed the vote. He did a great version of the song, but I still enjoyed listening to the Fats Waller version better. I do wonder if the name recognition did play a part in the votes. Sometimes I wonder if some of the voters ever bothered to listen to the songs at all. Personally, I thought it was a pretty good match up, and that both versions had amazing aspects to them. Actually my suspicion is that a lot of times folks don't listen very closely and pick the artist they know or one they like without even hearing the other choice. Hard to say though and I wouldn't want to make any direct accusations on that. I just accept the votes as they come in. But that's why I'll often try to stick to unknown quantities. Some of the songs I didn't know and some I did. What's fun about visiting your blog is I always learn more about the artists personal lives. I love that aspect as well. It's fun to see what the artist is all about in their personal lives, and how they've progressed in their careers. Awesome post! I particularly enjoyed the Cinderella video. They were great live. And all those cameos I'd forgotten were fun. I still enjoy Tom Keifer's solo "The Way Life Goes" from 2013. That smoky voice is to die for. I've never seen Cinderalla live. I bet that was a fun show! I almost went with a different song of theirs, but ultimately chose this one. Your song picks for the day were great! I love the BOTB, and the 4M is turning out to be a lot of fun, too! Google (or Bing) is my best friend sometimes. I found a site called Today's Birthdays in Music - There were actually quite a few musicians to choose from for today. Looking forward to next week! Oh gee, Cathy caught me after I posted my Music Monday post so I am off topic (she said it didn't matter) - I would have done something different. But never mind, because I get to rock to one of my favorite songs, "September". I can recall those bitter rows among the British on which was the better band,Blur or Oasis...turned out that both bands were pretty darn good!! I don't recall any bitterness, but then I probably wasnt paying much attention to them at the time. However, I do agree that they are both decent bands. I thought about using 'Easy Lover' but figured someone would be using it. I should have gone with a different Enrique Iglesias song though, as 'Hero' had a bit of overlap. Learned some new bands today. How fun learning celeb birthdays. I had no idea Enrique Iglesias was so young! I learn something almost every time I post. I think this post is just as much for my learning as it is for everyone else. I haven't heard Enrique in a long time.